Fianna Fáil spent the 1980s under the leadership of Charles Haughey. In 1977 the party had swept back in to power after four years in the wilderness, on a platform which centered around huge spending promises. By the time of the next general election in 1981, this spending had resulted in an economic downturn which seemed as though it was there to stay. Also by this time, republican prisoners in the H-Block of the Maze Prison in Co. Down had began hunger striking. The eventual deaths of ten of these prisoners led to an increase in support for republican elements north and south of the border - support Fianna Fáil was losing due to its perceived indifference to the so-called Northern Question. The party found itself back on the Opposition benches in this election, bested in the polls by the Fine Gael-Labour coalition. This defeat proved a particular setback to Haughey, who had wished to repeat the party's record 1977 result (an 84 seat majority with 50.6% of the vote). The elections of the 1980s would see Haughey trying and trying again to recapture this result, which was won under his predecessor Jack Lynch, but the party were not to reach such heights again. Haughey also dominated the themes of 80s Irish politics in another way: leadership challenges became frequent during this time - all of which failed. Haughey would remain leader of Fianna Fáil until 1992. 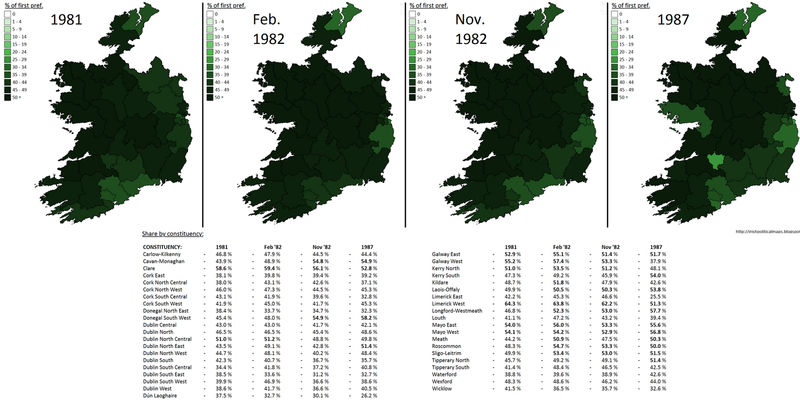 The division Haughey inspired both within his own party and in Irish society in general contributed in part to a shift in both Irish political culture and the hithero unquestionable dominance of Fianna Fáil, which prior to the 1981 general election had formed single-party governments for 42 of the previous 55 years. After a short sting back in power following an election in 1982, another poll 7 months later restored the Fine Gael-Labour coalition and put Fianna Fáil in Opposition for a further five years. In this time, the most serious threat to Haughey's leadership came with the defection of a number of prominent TDs, led by former Minister Desmond O'Malley. They formed the new Progressive Democrat party, which challenged the three main parties in the 1987 general election. Though they took much of their support from Fine Gael, Fianna Fáil lost considerable ground to them also - particularly in O'Malley's constituency of Limerick East, where the FF vote dipped to a then record low of 25.5%. While the party remained strong in its traditional rural west heartland, its fortunes elsewhere were slipping. Haughey formed a minority government in 1987, but the era of single-party Fianna Fáil governments was coming to an end.